Spring is in full bloom and my weekends have been spent soaking up the glorious weather, shopping at the farmer’s market, embarking on mini getaways and enjoying picnics in the park. 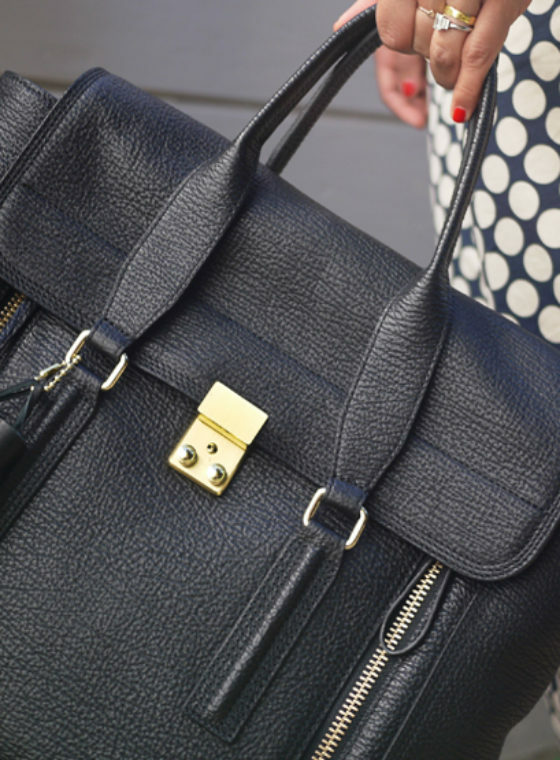 Surely, these outings need a carryall to reflect my chipper state of mind, right? 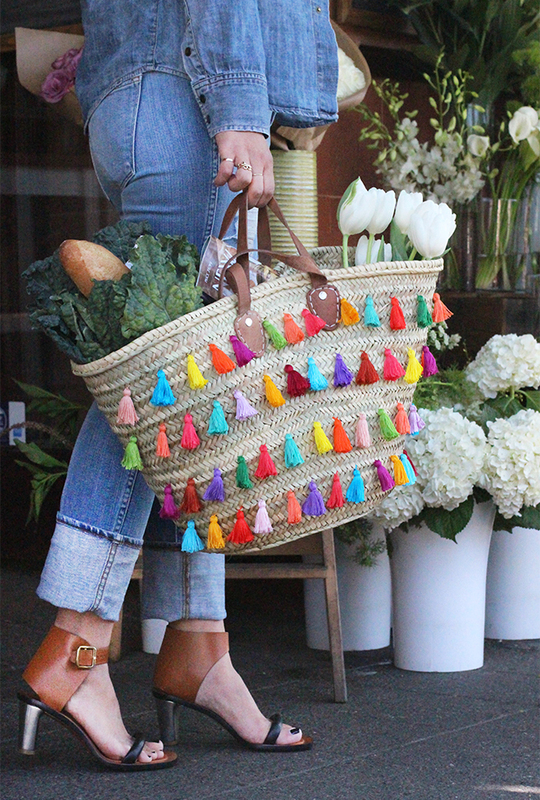 With a bevy of handmade, multicolored tassels, I gave the ubiquitous straw market tote a much needed makeover. The result is a bag that couldn’t look happier if it tried . 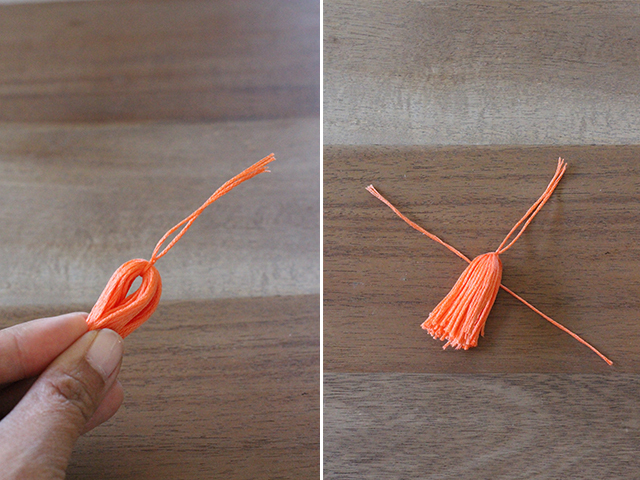 . .
For every skein of embroidery floss, you will be able to make 2 short tassels. 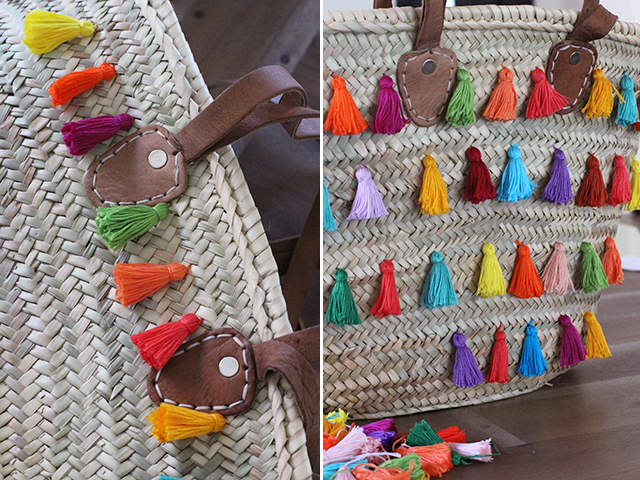 So with 60 skeins, you will get 120 tassels – this is enough to cover the entire bag. If you want to just do the front side, then 30 skeins should be enough. 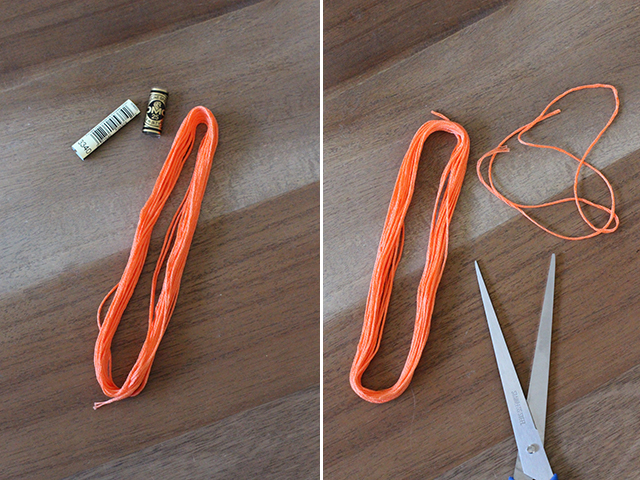 Start by removing the paper sleeves from the skein of embroidery floss. Cut about 16 inches of floss off the skein and save it for later. 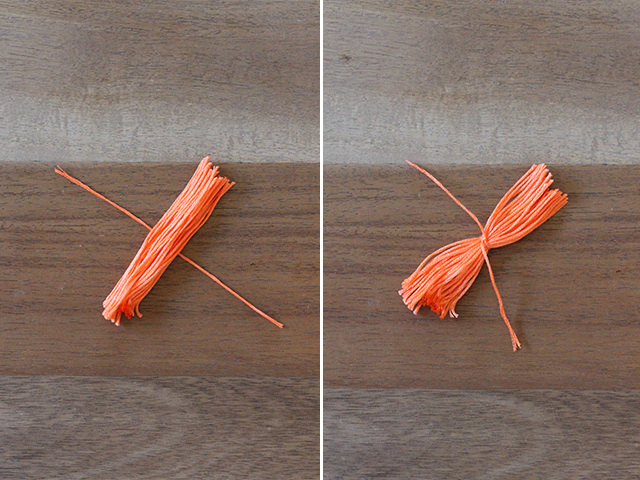 Cut the skein into two sections and then cut each of those sections in half to create a total of four sections. Combine two sections together. 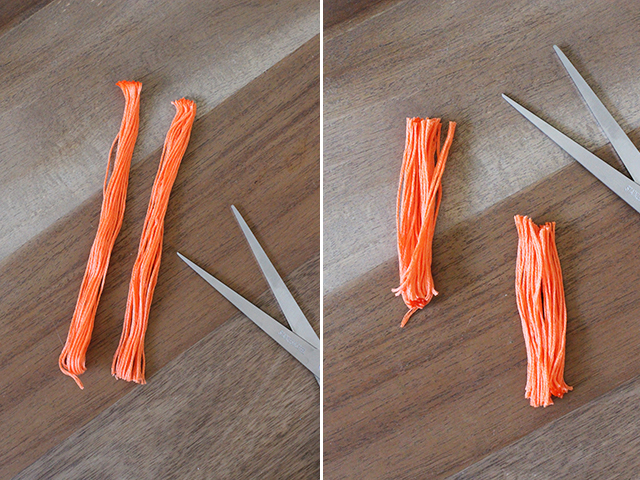 Now cut the 2 feet of extra floss into 4 equal sections. Center one of the strands under one of the bundles of floss and tie into a double knot. Fold the bundle. Center another strand under the folded bundle. Tie the top into a double knot. Trim but keep the top strands intact. 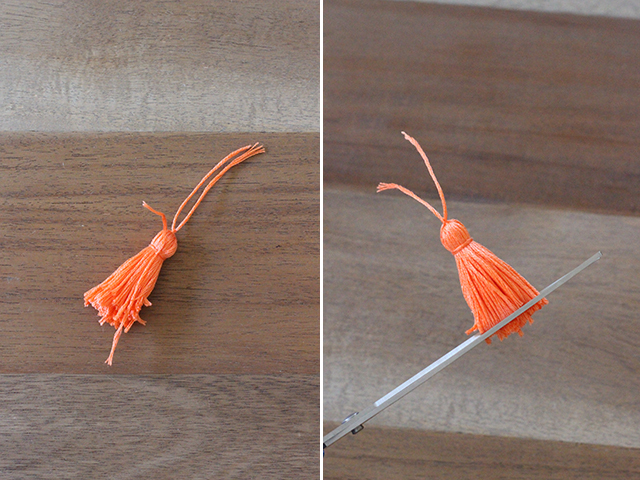 Turn on your favorite TV series and get ready to dedicate a couple of hours making tassels . . . 120 of them! Be patient – it’s so worth it! Thread one end of the strands through an embroidery needle. 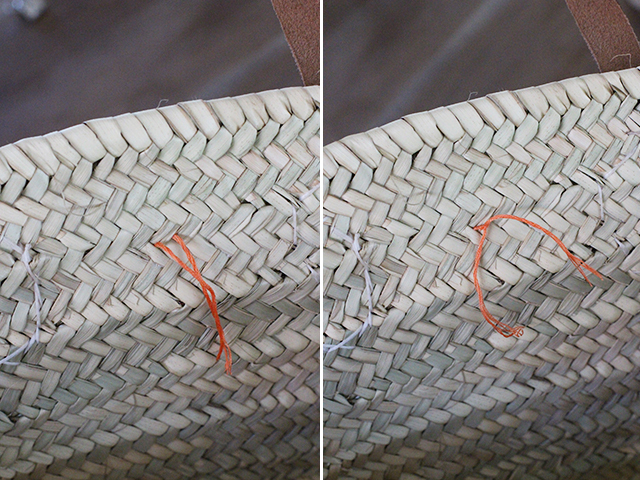 Sew one end through one section of the straw bag and sew the other end through the other side. 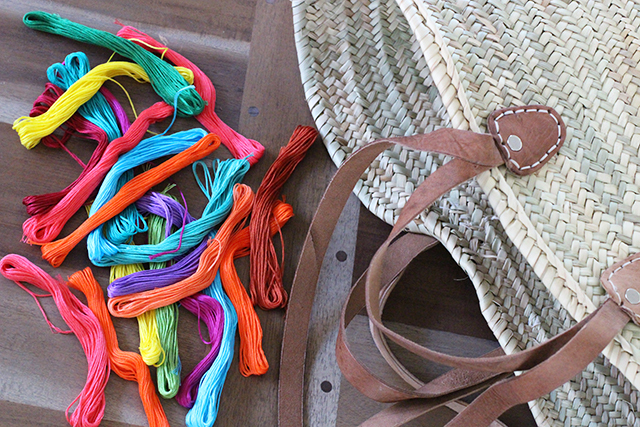 From the inside of the bag, tie the strands into a double knot. Continue tying on the tassels! Really love the bag!! Great DIY! I love it!!!! it’s so colourful!!! Oh my gosh. I LOVE this, so much!!!! Wow, that’s such a great idea!! I’ve been making my Xàbia Bags just literally last week (http://fabulousfinnish.com/?p=1794). 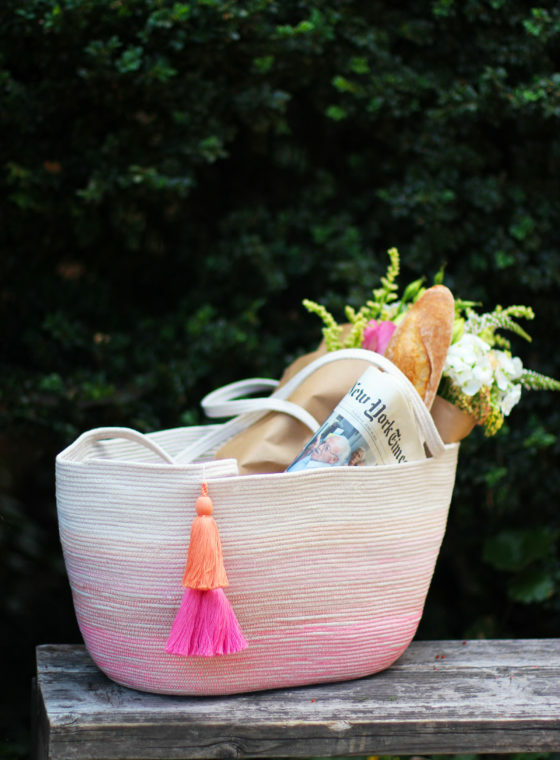 Definitely going to make some of these fab tassled bags as well! Creative you 🙂 Thanks for inspiring me! 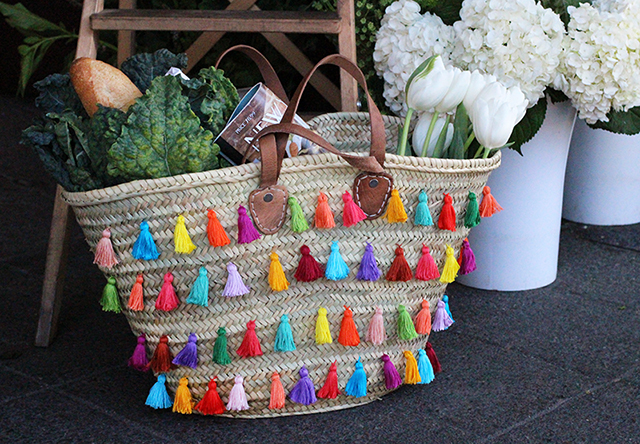 Absolutely loved this – I never knew how those little tassels were made but now I do – there’s no stopping me! Thank you! SO Cute! This is officially on our list of crafts! Love it! Did you do the tassels all the way around or only on one side? awww it looks so cool! Thanks for this awesome idea! The framer’s market is coming up soon where i live and that would be cute to tote around. PS where are you killer shoes from? I want them. How on earth do you make these things look so easy?? 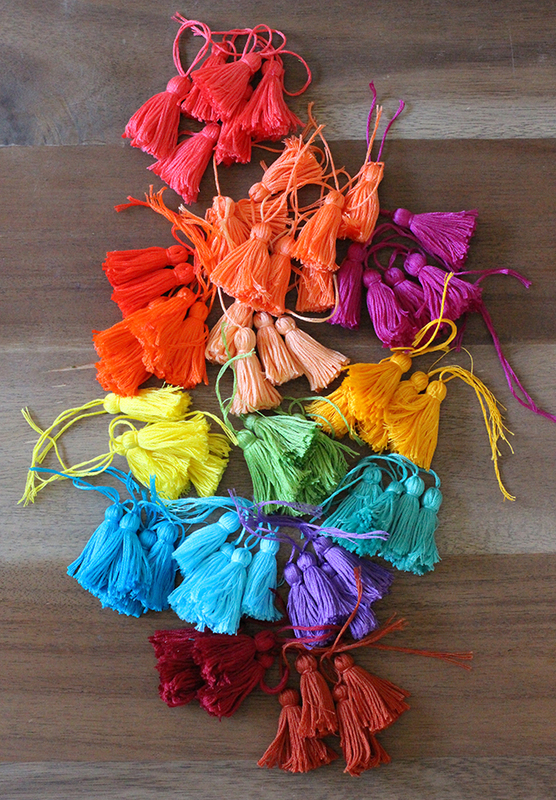 I love those coloured tassels and there is so much you can do with these. A nice bohemian necklace will look great! You NEVER disappoint. This is the cutest bag ever!!! !Please tell me where you purchased your shoes. They are soooooo friggin cute!!!! OK. This is excellent. So glad I paid attention during my color theory class. Will be applying this DIY to that straw tote that I was just about to throw away. Brilliant idea! BTW where you get your shoes??? You always have great DIY ideas!! Could you please tell me where these shoes are from?? Love them!! Good idea…. 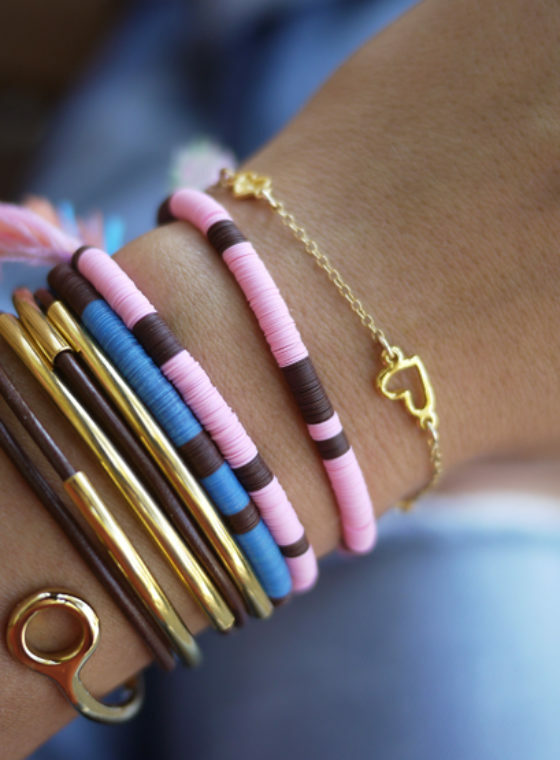 & nice combination colours. I like the shoes very much where to purchase?? Love this tutorial! 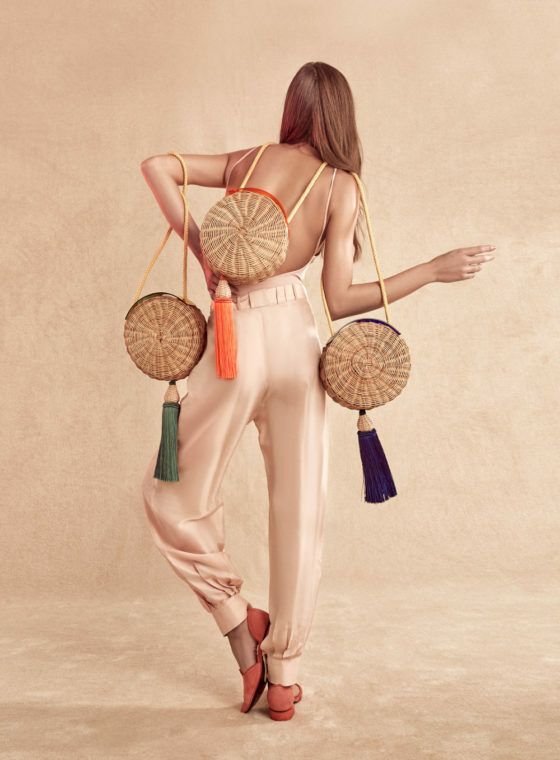 I saw some tassel bag sold in store, but I often don’t invest in them, I just buy bag which I could use in any occasion. 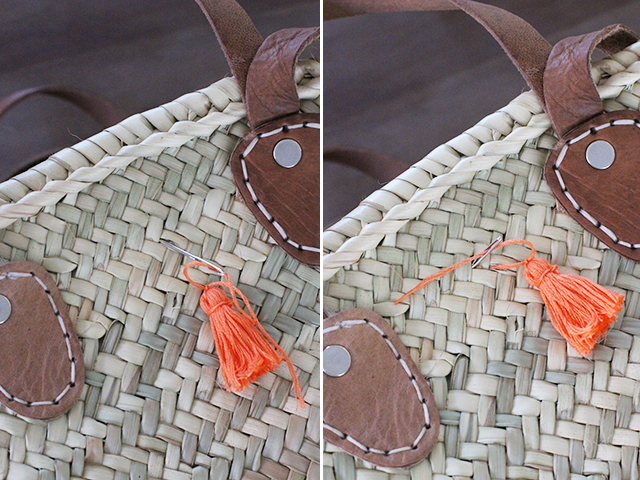 This DIY will help me have a tassel bag with no budget. I love your pictures are very inspiring, one of the pictures with the bag and colorful embroidery floss I just loved it, I need to ask for a permission because I want to use your picture as one of my profile picture for my slow fashion blog in Facebook, considering I am starting and I don´t have many pictures.